Traditions are built over time as a way of marking what’s important to our family. I like to think of traditions as modern-day altars of remembrances. Christmas traditions is an area that often runs away from us, and before we know it our traditions are controlling our holiday rather than helping us prize what’s most important. A way to help amplify the joy, lessen the stress, and simplify Christmas is to identify the Christmas traditions you currently have and evaluate what works for your family. Do they stay within your budget? Do they propel your family closer to each other and Christ? What’s important to your family? 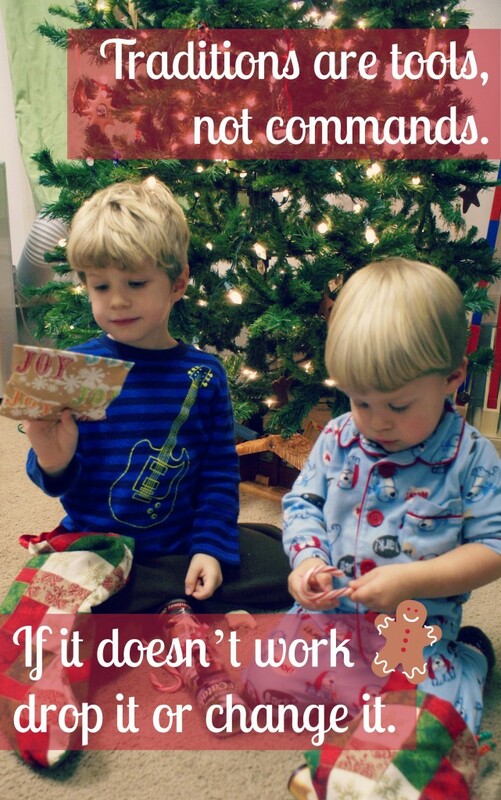 When examining our Christmas traditions it’s important to keep our whole family in mind. It’s easy as curators of our home to pick traditions that are most appealing to ourselves. Think of your spouse and children—what do they enjoy and value? What traditions draw their heart toward Christ at Christmas? What do you want to pass on to your children? Consider how your traditions reflect the vision and mission of your family, as well as your yearly priority. Sometimes simplifying means redefining our traditions, perhaps eliminating some, so that we are moving toward our end game–Christ in you, the hope of glory. One tradition we’re doing this year is celebrating St. Nicholas Day on December 6th. We’ve never made Santa a focal point of our Christmas, but he’s also never been completely excluded. We’ve taken pictures with Santa and have a few books and toys with Santa, but we’ve never had the kids write Santa a Christmas list or pretend gifts are from Santa. In the last few months, my oldest son has started asking more questions about Santa, how presents get to our house, and who gives us presents. By celebrating St. Nicholas Day, I hope he sees the historical “Santa,” but more importantly how Nicholas’ giving was out of a generous heart that loved Jesus and he gave greatly because so much had been given to him through Christ. We’ll have a few small things in stockings for the day (a new ornament and a candy cane), as well as $10 for the kids to pick something to give to another child in need (maybe a toy for Toys for Tots or something from the Compassion Christmas catalog). Is this tradition something you’ve always done, decided to do one year and it just stuck? Was it a tradition passed on from your families, do you even like it, or do you feel compelled to do it? Why are we celebrating St. Nicholas Day this year? 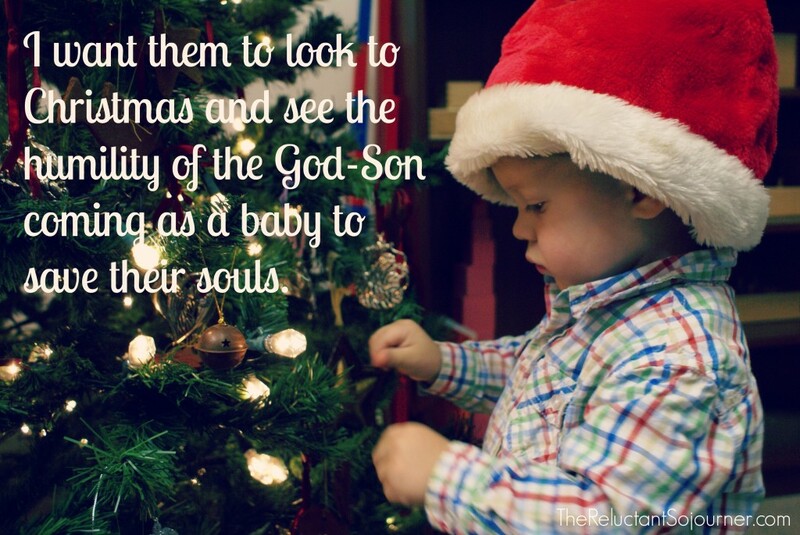 I don’t want my children’s Christmas’ filled with more stuff and I most definitely don’t want their hearts to look to Christmas and see Santa and getting and ‘more for me.’ I want them to look to Christmas and see the humility of the God-Son coming as a baby to save their souls. I want them to look to Christmas and see the generosity of a servant, whom culture has turned into a reason to pile high the tree skirt, who loved greatly and gave greatly without looking for something in return. I want them to look to Christmas and see the sacrifice of Jesus that brought redemption. As I’ve thought of traditions I’m reminded of the altars God’s people built as they journeyed through life. I see them as stone pillars set in a field and as each generation passes they’re reminded of what God did for them there, in that place. Remember traditions are tools, not commands. If it doesn’t work drop it or change it. A Gentle Reminder: As a young family, you don’t have to continue every tradition each of your respective families have done. Pick what you want, but remember you’re making your own family now. This is your family–not your parents, not your grandparents. You can break from past traditions to adopt new ones that fit the vision for your family. 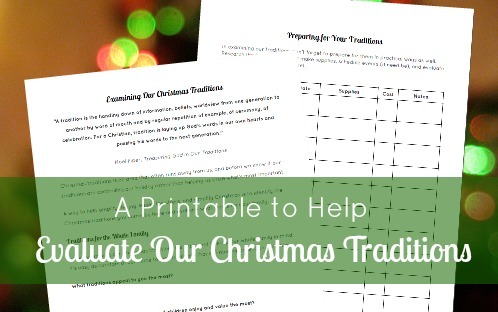 Print a copy of Examining Our Christmas Traditions and make a plan for what traditions you hope to do this year and why. What do they say about your family and what you’re remembering? I see another book forming here. Just saying, awesome writing and message.